Click the button below to add the Brașov by Piorkowski to your wish list. Brasov is a beautiful resort town in central Romania, at the southern tip of the Carpathian Mountains. When the composer visited Romania in 1989, the country was ruled by a brutal dictatorship. The secret police (the Securitate) was oppressive and the prevailing mood was one of intrigue, danger and mystery. This composition attempts to retrospectively capture the circumstances experienced in Brasov. 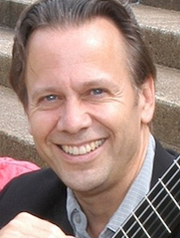 “ James Piorkowski is a SUNY Distinguished Professor at the Fredonia School of Music, State University of New York, serving as head of the guitar program since 1983. In 2006, Piorkowski was the recipient of both the President’s Award for Excellence and the Robert W. Kasling Award for Scholarly and Creative Excellence. He was the recipient of the University’s William T. Hagan Young Scholar/Artist Award in 1998. Piorkowski's live guitar performances have been described as "expressive and stupendous" -The Gleaner, (Kingston, Jamaica). His recitals have been heard in Spain, France, Germany, the Czech Republic, Hungary, Slovakia, Puerto Rico, Venezuela, Jamaica, Canada, and throughout the United States. At the 2006 Guitar Foundation of America International Convention at Columbus State University (GA), Piorkowski performed his composition for mixed choir and guitar, The Greatest of These, which was featured as the opening work of the opening night gala, a concert considered by many in attendance as one of the most memorable musical events in the history of the GFA. As a composer, James Piorkowski has written many pieces for guitar, both in solo and in chamber settings. His musical language, while described as both erudite and multifarious, remains accessible. “Piorkowski is a modernist, always experimenting as he moves easily from tonal to atonal formats.” –Fanfare. Piorkowski studied composition with Anton Wolf at the State University College at Buffalo and with Donald Bohlen at the State University of N.Y. at Fredonia. He also has had classes with Aaron Copland, Jacob Druckman, Lucas Foss, Morton Feldman and Milton Babbitt. Piorkowski’s recording, Sentient Music, (Centaur Records) features seventeen original solo guitar compositions, including his increasingly popular Sentient Preludes. Critics have called the recording, "an absolutely engrossing collection. "- Buffalo News. Classical Guitar Magazine (UK) stated, “his compositional skills are illustrated in a very favourable light, with his work conjuring up musical imagery, extending through a whole assortment of emotions from jubilant and rhythmic, to the impressionistic.” His collaborative album, Freedom Flight: Guitar Music by Ortiz and Piorkowski, features original compositions for solo guitar, two guitars, flute/guitar and voice/guitar. Piorkowski’s works are "inspired by Shakespeare, Venezuela, and religious imagery when he sets out to work his magic" - El Nuevo Dia (San Juan). The CD has been summed up as: "Great music and wonderful musicians" - American Record Guide. For eighteen years, Piorkowski was a member of the world-renowned Buffalo Guitar Quartet. The BGQ toured internationally and released four highly acclaimed recordings. Guitar Player Magazine stated that the Buffalo Guitar Quartet was "one of the world's premiere classical guitar ensembles."